Rongotai offers a broad curriculum for all its students, meeting the needs of the New Zealand Curriculum 2010. In Years 11-13, Rongotai offers courses at all levels of the National Certificate of Educational Achievement (NCEA). All students study the following subjects: English, Mathematics, Science, Social Studies and Health and Physical Education. During the first term, all students receive four hours’ teaching in each option subject (Art, Economics, Latin, Samoan, Spanish, Maori, Music, Graphics, Material Technology). They then choose two of these subjects to continue learning for the rest of the year. All students study the following subjects: English, Mathematics, Science, Social Studies and Health and Physical Education. They choose two option subjects which they study for the full year. Boys study six subjects. English, Mathematics and Science are compulsory. Boys generally study five or six subjects. It is possible to repeat Level One courses if pre-requistes for Level 2 courses are not met. 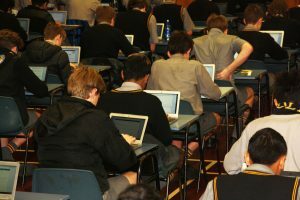 Boys study five or six subjects at the appropriate NCEA level. The Curriculum Overview is designed to show the subjects that are available at Rongotai College, and also to show the progression of subjects within each learning area.